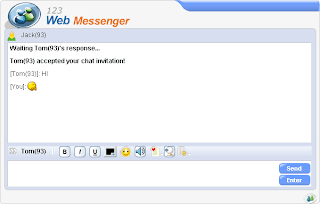 123 Web Messenger is a web-based instant messaging client for your own website. It's fully integrated your existing user database and enables one-to-one chat function to your website users. The key feature is the invitation box which pops up from the webpage. · User initiates one-to-one chat with other user, on the same website. · The opponent has a choice to accept or decline the invitation in the site messenger. · The invitation box will pop up from the webpage cause the code was embeded there invisibly. · One user can start multiple private chat with different users simultaneously. · bother to register or login again. All users are automatically logged into the web messenger system by default. · The "invite chat" button can be embedded to anywhere on your website, totally up to you. · Pure flash client, the end chat users don't need to install or download anything to use chat. · Chat client is cross-platform, very user-friendly. · Stable and reliable, low bandwidth consumption. · End users can get attention and add more fun to chat using avatars, smiley/emotion facility. · Font style/ Font color. · Video chat facility, optional. · End users can chat behind firewall if you run the chat on port 80.